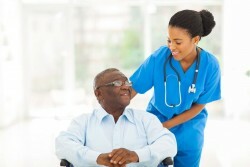 Every November the United States celebrate the unsung heroes who care for patients across our country: caregivers. Whether they work at an institution or in a private home, caregivers depend on communication to do their job well. Communicating is a two-way street and involves more than just the caregiver and the patient – doctors, family members, friends, and peers are among those with whom caregivers must communicate on a daily basis. Here are four areas of communication pivotal to any caregiver. Even if you’re not a caregiver, these tips may prove useful. Listen. Information is important to any role, but as a caregiver, when health is the focus, it is the most crucial part of the job. Ask questions and pay attention to answers. Allow patients time to express themselves, as some may need longer than others. Maintain eye contact with the speaker to show them that you’re paying attention. If possible, converse in a distraction-free area that will aid in both your listening and the patient’s focus. Speak effectively. Use the name of your patient to maintain their attention. Speak slowly, clearly, and at a speed your patient can comprehend to ensure that you are being heard. Talk about one thing at a time and make sure the person you’re caring for understands what you’ve said before changing topics. If they are struggling, don’t repeat yourself, but try to rephrase in a way that they might better understand. Consider posture. In some situations, body language can speak louder than words. Pay attention to physical cues from the person you are caring for, but be aware of your own nonverbal gestures as well. Use hand signals, lightly touch their arm and shoulder, and point when necessary. Try not to move when listening, allowing your patient to know they have your full and undivided attention. Be patient. This may be one of the most difficult parts of caregiving, and understandably so. Take deep breaths. Avoid arguing and remember to always treat your patient like an adult. If you get frustrated, take a break and return to the situation when tempers are cooled. As important as it is to be a caregiver, don’t forget that you need to take care of yourself and make time to address your needs too. The communication needs of every patient are different. Pay close attention to the cues given by the one you’re caring for and adjust your technique accordingly. Thank you caregivers for what you do, and try to enjoy an extra bit of you-time this November. After all, it is your month. Richard and Candy Robl share how they’ve kept their relationship strong for more than 48 years.